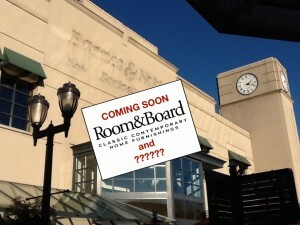 The Seattle Times announced today that Minnesota-based modern furnishings maker Room & Board would be moving in to the recently vacated Barnes & Noble space at University Village (2623 NE University Village St). Room & Board will take up just over half of the building’s available space, and will be located on the second floor. The opening is slated for this fall, says the Seattle Times. No word yet on what the leftover 19,000-square-feet will be occupied by, but the decision to split the space up comes as no surprise — this plan was revealed as a possibility back in October when the bookstore’s closure was first announced. The University Village Barnes & Noble opened in 1995 after the Lamonts department store’s lease expired in 1994 — in a manner baring a slight resemblance to Barnes & Noble’s own issues-about-leases exit from the upscale outdoor mall. Lamonts had operated in the U-Village for 26 years, replacing the Rhodes Department Store before it. What do you think, folks? Room & Board a good fit for the old space, or were you secretly hoping for The Return of Lamonts? UPDATE (Friday, January 13): The print edition of today’s Seattle Times had an artist’s rendering of what the Room & Board might look like (provided by Room & Board), as well as a picture of the same corner of the building (taken by Seattle Times photographer Ken Lambert) while it was occupied by Barnes & Noble.